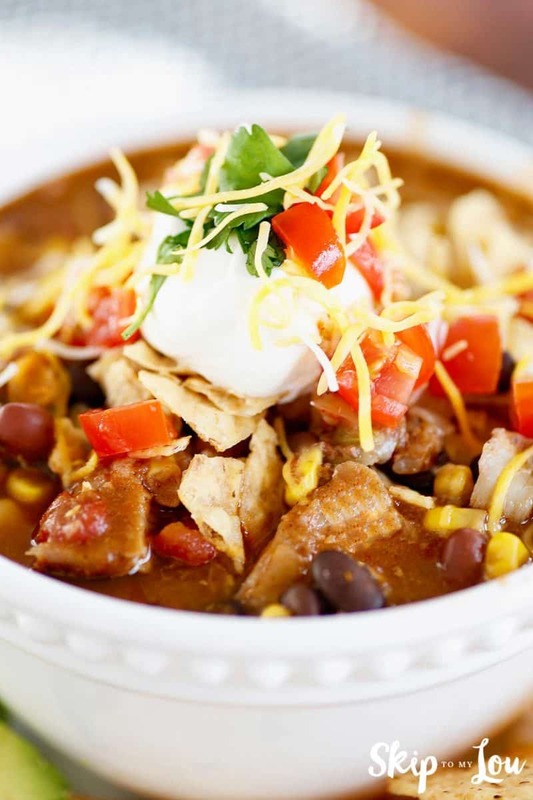 Warm your belly with a bowl full chicken taco soup. Make this easy soup in the slow cooker, instant pot or stove top. This spicy soup is full of flavor! This soup could be made with ground beef instead of chicken if you like! Black Beans corn tomato sauce diced tomatoes and shredded chicken make this a great recipe! I add in all my own seasonings like chili powder and cumin so I know there is no hidden gluten in my soup. However, you can omit the spices and add a packet of taco seasoning and stir. Make this yummy soup in the Instant Pot and you can have it on the table in less than 30 minutes. This recipe calls for a cup of water, I often will substitute beef or chicken broth. 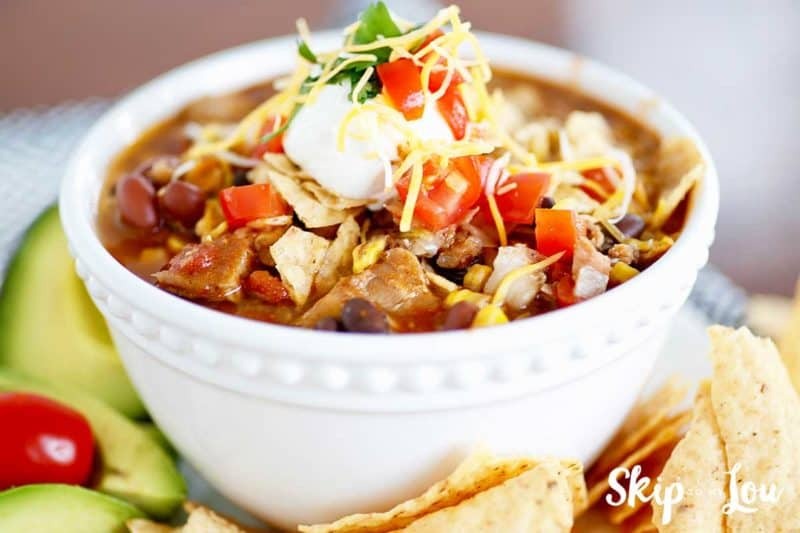 Serve topped with shredded Cheddar cheese, a dollop of sour cream, and crushed tortilla chips! 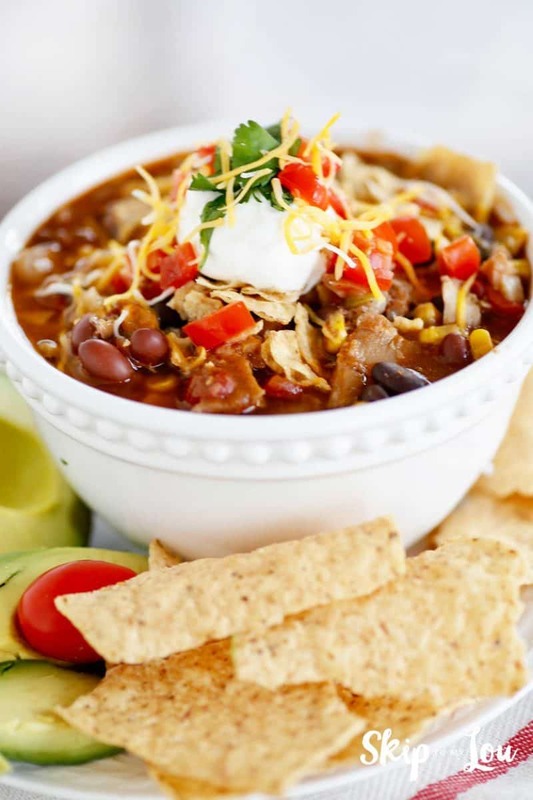 Place the onion, chili beans, black beans, corn, tomato sauce, water, chicken and diced tomatoes in a slow cooker. Add seasonings, and stir to blend. Crock Pot: Cook on low heat, cover, and cook for 6-8 hours. Instant Pot: Cook on high-pressure manual for 15 minutes with 10 min natural release. Serve topped with shredded Cheddar cheese, a dollop of sour cream, and crushed tortilla chips, if desired. This soup makes a great dump meal! Place all the ingredients (except water or broth) in a gallon zip lock bag. Label with a note to add 1 cup water. If frozen add 10 minutes to the Instant Pot cooking time. Cook 8 hours in the crock pot. Soups make for an easy meal and my family loves them. Add a side of veggies and dip and it is all you need for an easy weeknight dinner. Here are some of our family faves. 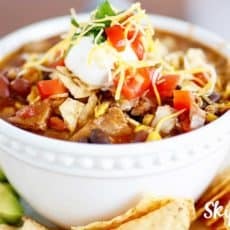 It is easy to make any of these soup in the slow cooker or Instant Pot. When using the Instant Pot just make sure you have enough liquid to make the pot pressurize.